You know you’re hooked when eggs become a daily dietary staple for you. How many eggs you eat, may just come up as often as how much you lift. Then again you think eggs; you think cholesterol and you tend to pull back. 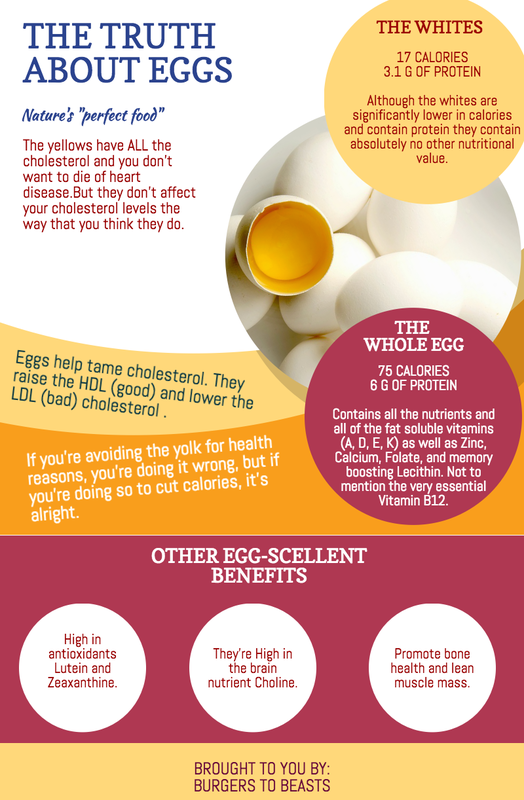 After all a single egg contains about 186 mg of cholesterol and that’s about 62% of the daily-recommended intake. So you’d think that eating cholesterol directly contributes to raising blood cholesterol and spurring on a range of diseases. Well in truth, it’s not all that simple. Have you ever thought, that maybe you’re not getting the whole picture? For starters, eggs are extremely nutritious. It helps build the outer coating of cells. It helps produce the necessary bile acids, required for digestion. We wouldn’t exist without it. Given how important it is, our bodies have developed definite mechanisms of producing it. That’s blood cholesterol. The cholesterol you derive from food is labeled as dietary cholesterol. Dietary cholesterol is poorly absorbed and rapidly eliminated, which means the amount you consume has very little to do with your blood cholesterol levels. Therefore, the more cholesterol you consume, the less your liver will produce it. Long story short, the total amount of cholesterol in the body will vary minimally. So, why do doctors hate it? Years ago, health care professionals found compounds that clogged arteries and resulted in heart disease. Easy, they blamed cholesterol solely for this occurrence and advised the consumption of low cholesterol/cholesterol-free foods i.e. less meat more plant based foods. Think for yourself, if that were the case, how would so many vegetarians suffer from cholesterol problems? You’ll probably agree now that it’s a lot more complex than you’ve ever imagined. When it comes to keeping your cholesterol in check, you need to reduce your LDL & increase your HDL (within safe limits); not send your total levels plummeting down the drain. Okay, so we’re starting to see that cholesterol is more complex than initially imagined. Are you questioning everything that you’ve been told? A few years ago, a bunch of researchers questioned whether there was at all any link between cholesterol and heart disease. So business 101 correlation doesn’t prove causation. Now, in the last ten years, additional research has questioned whether or not there is any link between dietary cholesterol and heart disease. Meagrely lowering your cholesterol isn’t a sure shot way to live longer. It’s not the sole cause of disease, but it can definitely be a contributor. By no means do I imply that your doctor has been wrong. What I do ask is that you take control of your lives and know what you’re putting into your body; be it food or pills. So how many eggs can one safely eat? For an average individual, assuming that he/she isn’t involved in training of any sort, it’s safe to eat up to 3 WHOLE eggs a day. There isn’t any significant data portraying the effects of consuming more than the said number daily. However, when it comes to athletic individuals or those who exercise daily, their protein requirements vary depending on the type of sport/exercise regimen. For example a weightlifter will require more protein than a runner. Having said that, if your goal is to maintain a restricted calorie intake, you needn’t concentrate on the yolks and simply stick to the whites. However, if you’re eating for health and to derive maximal nutrition, the consumption of 3 WHOLE yolks a day, is absolutely fine.